Andreas Bittner, born in 1955, is a German attorney, notary public, and public auditor. He advises business persons and business enterprises on distribution law with a focus on information technology law, company and partnership law, and real estate law. notarized recordings, especially in the areas of company/partnership law, real estate law, and wills and probate; procedural law applicable to German notary publics. Andreas Bittner studied law at the University of Frankfurt. He obtained a doctorate there in 1986, the topic of his doctoral thesis being in the area of property rights. Mr. Bittner was admitted as a German attorney in Frankfurt am Main in 1984. He also acts as an arbitrator at the Permanent Court of Arbitration of the Frankfurt Bar Association. 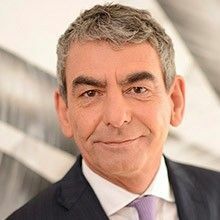 Andreas Bittner is a member of the German Bar Association's sections on international legal relations and law firm management. He has been with GGV since 1984, several years of which were served as managing partner.